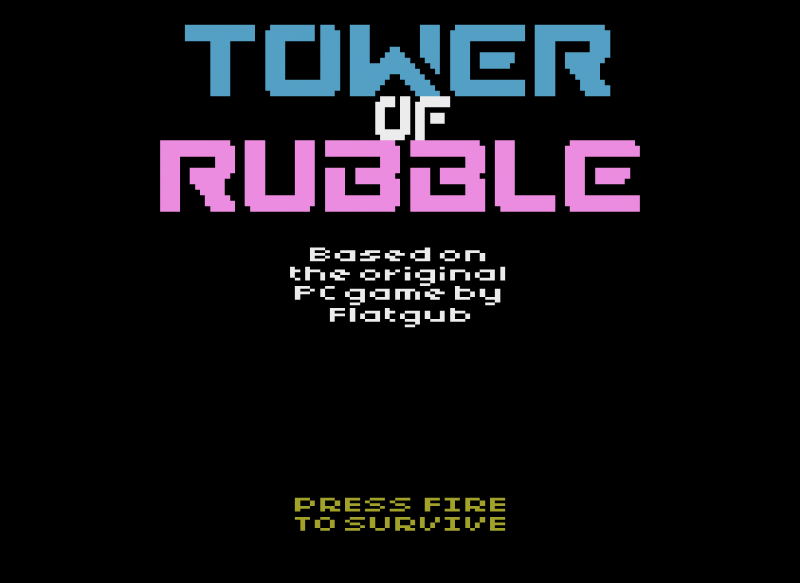 So DionoiD has now released his WIP of Tower of Rubble and his take is amazing to say the least! Great visuals, music and game play really makes it a fantastic Atari 2600 conversion. So for now I'm going to leave this to one side - I might pick up the game to maybe do something different down the track. I'm also making the source code available if anyone wants to make use of anything. This is my first Atari 2600 game written batari Basic and DPC+ as a way of learning to code the Atari which I have recently returned to after a very long hiatus. I started coding just before Christmas so about 4 weeks worth of work so far. sound and music - always an issue for me but we'll see how I go! horizontal beam - will need to look at drawing this with the background (I believe?) - have about 900 bytes available in the bank I'm using for the beams. 17/01 - Currently it appears the game doesn't work on real hardware when launching off the title-screen (frame overrun) - will investigate. 20190121 - all frame overruns should now be removed (Stella is showing no overruns) as I've fully split the game initialisation (start) and beam completion (ie. main beam - adding tile, crumbling beam - removing columns) over multiple frames. This should set me up for adding the next horizontal beam (fingers crossed). 20190117 - this release includes some sounds (Walk, Jump and Death), a number of optimisations to provide better/faster access to the ram bank, reduced cross-bank access (found 1 or 2 not required) and cleaned up a lot of no longer used code. The game runs a lot smoother and seems to have removed most/all frame overuns (finger crossed). Edited by mksmith, Mon Apr 1, 2019 4:44 PM. 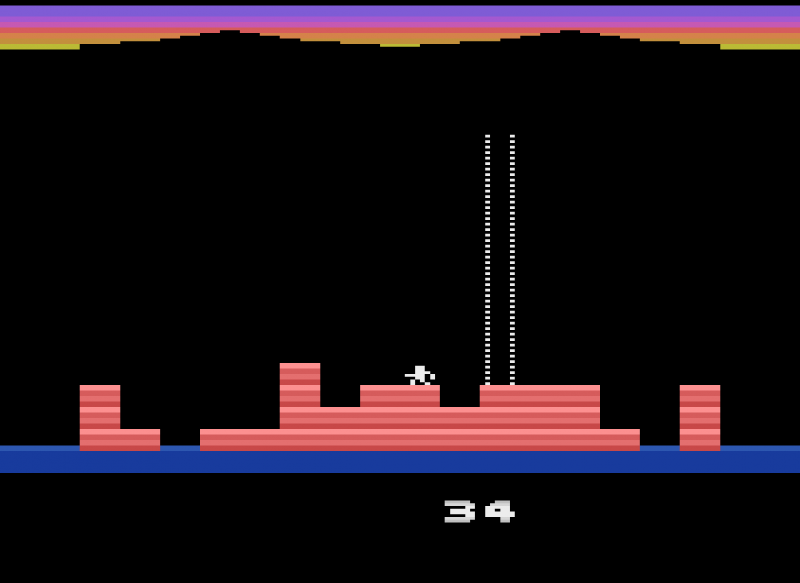 I love how the terrain that the player is standing on looks quasi-3D. Wow, this is a great start! I'll be featuring your game on this Wednesday's ZeroPage Homebrew Twitch livestream. :-) Please PM me with any more details about yourself or the game that you'd like me to talk about on the show while we play it. @NostAlgae37 - thanks! Would love a bit of variation if I can just not sure how that could work. @cimmerian - wow that would be great! I'll PM you. We'll be featuring Tower of Rubble on the ZeroPage Homebrew Twitch stream tomorrow (Wednesday) at 11AM PT/2PM ET! Hope everyone can tune in to watch us play! Tower of Rubble looks great, nicely done. Love the player animation! @metalbabble - thanks getting there hopefully soon! A new release is now available in the first post. Spent the whole day cleaning up, reviewing and optimising code which has reduced frame overruns to none (hopefully!!). Edited by mksmith, Wed Jan 16, 2019 7:53 AM. This may seem like a strange question, but how do I jump? Fire button starts the game, but then seems to do nothing. I can run and climb, and that's all. Edited by fluxit, Wed Jan 16, 2019 12:40 PM. I had wondered the same, but I think jumping just involves running off the edge of a block to catch one that is nearby. Hey guys - all controls are with the joystick only - so no fire button (I've actually yet to play with a joystick myself - just the keys). there is a short jump (between 1 tile gap) and a longer jump (between 2 tile gap). Hopefully that helps. I'll add this to the top. Thanks to @cimmerian showing me the debugger I've investigated the cause of not working on release hardware (massive frame overrun when starting). I've provided him with a new build to test and will release it once he gives me the go ahead. So initialising DPC+ ram, tiles, player and beams all at once appeared to be the issue. So what I've done is add an initialisation routine with runs for 100 frames (leaves a bit of room if required). During this I set everything up a frame at a time (the DPC+ ram clear takes about 16 frames to process for example - each row of tiles on the map). I've done a similar thing when destroying tiles after the secondary beam finishes. Anyway during this period the player now flashes identifying the game is about to start so it all fits together nicely. The fix provided to @cimmerian worked well but we still have a slight frame overrun when the crumbling beam is finishing. I've got some ideas about fixing that but will check that out once my harmony cart arrives next week. In the mean time I've spent the past couple of days building a Visual Studio Code extension for batari Basic. Got the syntax highlighting done (for the most part) and just got the compile process working (not fun but actually easy enough in the end). As my code is now quite large Visual bB is becoming a real pain to edit as it constantly jumps around when pasting. I've included bB and Stella along with it (with options to provide you own paths) - will have a play and see how that works. Will release it once I've spent some time with it. Edited by mksmith, Sat Jan 19, 2019 7:30 AM. It also maybe doesn't have to be two players and flicker, other then when the beam is on, two nusiz copies and the different nusiz spacing might do? If you put it to the right the second copy will wrap around and appear on the left, might not be worth the effort tho? What do you mean by secondary beam? is there ever more then one beam? vertical or horisontal? It's a good fun game - the original designer did any awesome job of the graphics and they do suit the Atari very well. I was thinking about other modes of play also - collecting coins (or diamonds?) might offer another way of play. Will it be worth getting the coin? Yeah I've noticed those 2 lines on the crumbling beam also - wasn't sure how to deal with those but I think you've hit it on the head! Still working through whether I have a 2 player option (which I think would be fun!) - but flickering would be an issue. The secondary beam is the crumbling beam - I think I'll rename that above in the description. There is a horizontal beam which slices though the tiles and drops them down a layer (a bit like how Tetris does it when you fill a row). There are also 2 others which drop tiles in different ways to the main one. Working out whether I can fit (or need) those still as the size of the playfield is quite a bit smaller than the original game. Edited by mksmith, Sat Jan 19, 2019 7:27 AM. 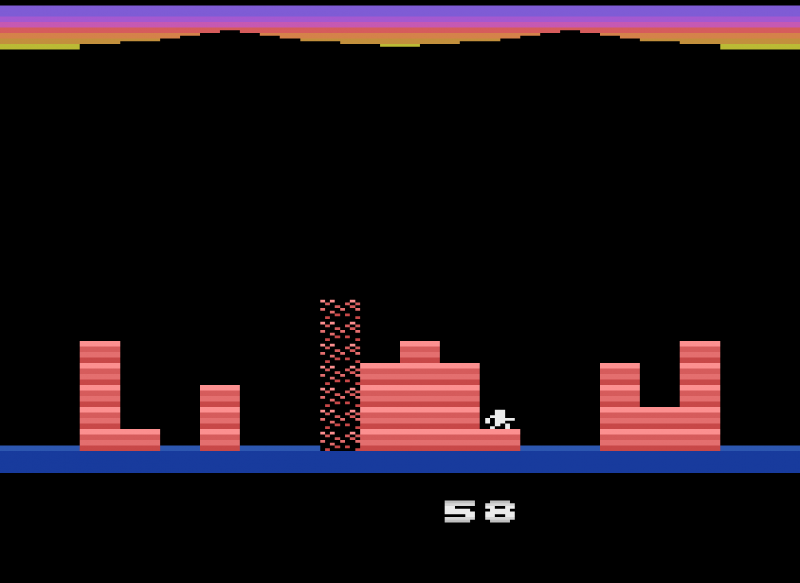 Whoa, another developer doing Tower of Rubble for the '2600? No need for apologies, Matt; your version looks and plays nice. 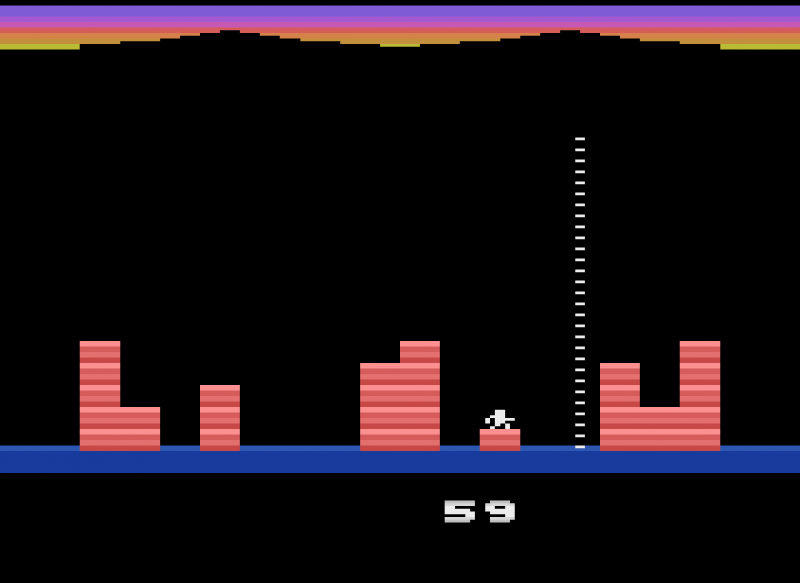 Really impressive for your first Atari 2600 game! And it doesn't look like a typical batariBasic game, which is a good thing. Of course using DPC+ allows you to add much more visuals to the game compared to the 'vanilla 6507' assembly port that I am working on. But in the end it's the game-play that matters, and I think you're on the right track here. It looks like the Atari community will get (at least?) two good versions of Tower of Rubble to choose from this year. Knowing that good '2600 developers are scarce, it's kind of a waste to have two developers working on their own version of the same game. But on the other hand: developing games is fun, and that's what it is all about. This is coming along really nicely, both versions are actually. I like how you can turn on the spot & really superb animation. Might just be bad luck, but I had a couple of respawns and then was insta-killed by the beam. Edited by Muddyfunster, Sun Jan 20, 2019 3:04 PM. @Dionoid - thanks for you kind words mate. Having the same game done in different ways can bring a kind of variation to the game too. As said so looking forward to seeing your version!! Yeah did a frame by frame analysis of the player animation and movement then used that in my little animation engine. @KevKelly - yeah would make a great double-ender! @Muddyfunster - Thanks! I having been thinking about making sure the first beam is not on the player to give you a chance to get into it. Well done on your work also! Edited by mksmith, Mon Jan 21, 2019 6:59 AM. New build up which should now run without any frame overruns as I've split all the game initialisation and beam completion processes over multiple frames. Thanks again to @cimmerian for his testing and identification of these issues. Next up is the horizontal beam which will be very interesting as it will probably involve clearing pf tiles and drawing the background colors to simulate the beam. Once the beam is complete all the tiles above drop down ah-la Tetris style so that's going to be good challenge to program! My harmony cart is in my home city so delivery should be any day now (hooray) as I can't wait to test the game on the real thing. I've also been working on the VS Code extension but a little programming with it tonight is feeling good (I do a lot in Visual Studio for work so a familiar arrangement). Edited by Lillapojkenpåön, Mon Jan 21, 2019 3:42 PM. Edited by mksmith, Mon Apr 1, 2019 4:45 PM. So my dream of a Tower of Rubble double-ender is squashed?